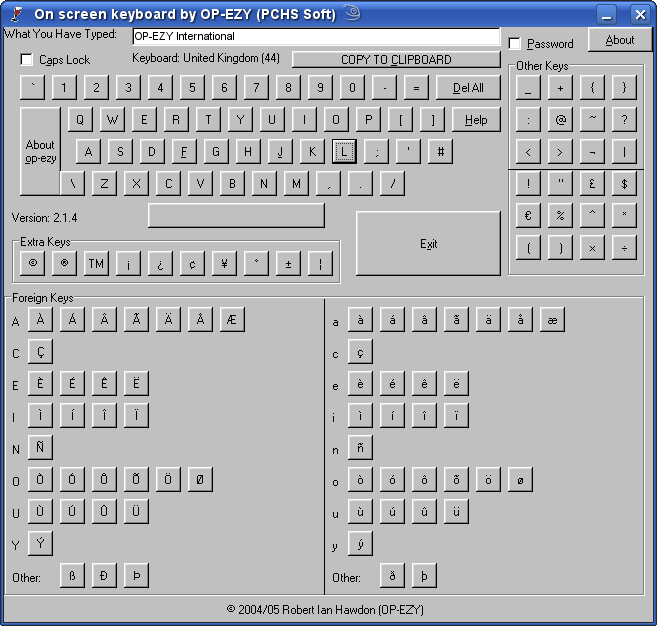 OP-EZY On Screen Keyboard was a program created to avoid keyloggers back when I (Robert Ian Hawdon) was 14 years old! 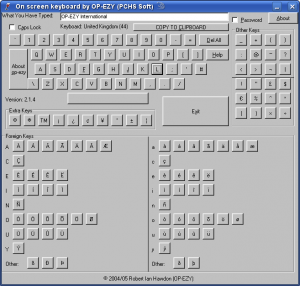 It worked by typing letters into a textbox and then allowing the user to copy the contents to the clipboard. Of course, firstly, this isn’t recommended if your clipboard is also being monitored. And if you suspect your keys are being logged, then you should really should clean out your computer with a good virus/malware scanner. This software is classed as Legacy, and will, at some point, be updated for use with current systems in mind. Donations shouldn’t be made to Ponteland High anymore (as I’m no longer a student there) though, there’s nothing to stop you should you wish. Donations to the developer can be made with the PayPal button below. The program requires vbrun60 to be installed. Weather is set to reflect the current conditions at OP-EZY HQ.